Autumn is in full force, and while this season is typically associated with the senescing of flora, if we look closely we will also notice a yang to this season’s yin: the blossoming of autumn wild flowers. This is yarrow (Achillea millefolium), an herbaceous perennial that can be found flowering typically from June through September in Pennsylvania. 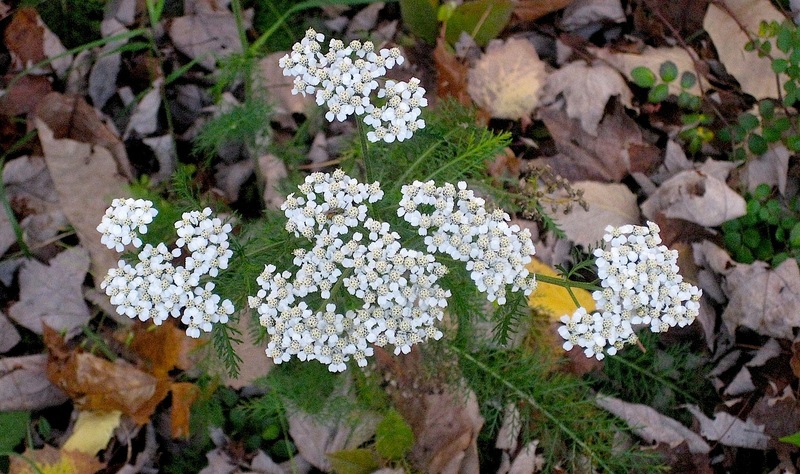 If you look carefully, and if the conditions are right, you can still find yarrow in flower amongst the autumn foliage through November. This photograph was taken in western Pennsylvania in late October. Several traditional uses have been attributed to yarrow by cultures from all over the world, the most common including the treatment of skin issues, respiratory illnesses, digestive problems, tooth aches, and eye problems. Most of the studies on yarrow have been either animal or in vitro (think petri dish/test tube) experiments, and in these studies yarrow has been shown to demonstrate antibacterial, anti-inflammatory, gastroprotective, and blood coagulation inducing effects (Applequist et al., 2011). Few, if any, human clinical trials have been conducted on yarrow, though this current reality does not render the herb’s medicine ineffective. Contemporary advice is best viewed through multiple channels, traditional use and modern research being two of them. Too often, we rely on the latter at the expense of the former (low fat diets anyone? ), and are left with an unbalanced projection of reality. But anyway, look for yarrow in fields and roadsides, from now until who really knows when … (I’m not the creator, just a messenger).